Add a historic hint to your bird garden by placing this Heartwood Blues Bird Barn Bird House in it. Not only does the shape evoke classic barns of the past; the item is also made from cypress reclaimed from a 19th century building for a fantastic bit of living history. The square body provides plenty of room for a bluebird or chickadee family, and the 1.5" diameter entry allows them passage into the unit. A painted cypress, pitched roof both overhangs the entrance hole and fully covers the shelter, assisted by wooden trim beneath this generous edge. A cupola tops the roof for traditional shape, and a cast iron rooster figure here furthers the farmhouse motif. The aged gray tone contrasts the rust colored roof for an antique hint, and the cypress construction will remain beautiful for many seasons. Remove the disc from the back of the home for seasonal maintenance or nest checks, and display this unit on a post using the hanging hardware attached to its back. 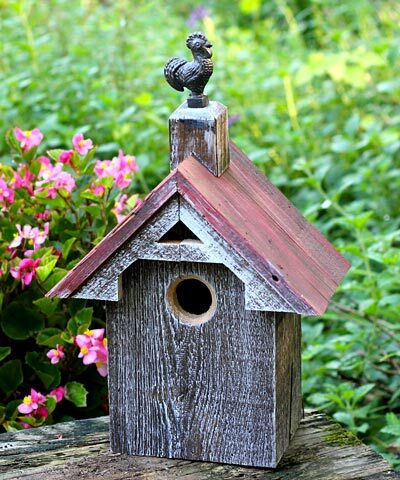 Turn your landscaping into a rustic avian retreat with this Blues Bird Barn Bird House. Made in the USA.